The Bowling Green State University planetarium program for Spring 2013 includes a handful of one-night engagements and a full program of throw-backs to the 80's. The planetarium is a little retro in a cool way, definitely never crowded but never completely empty. 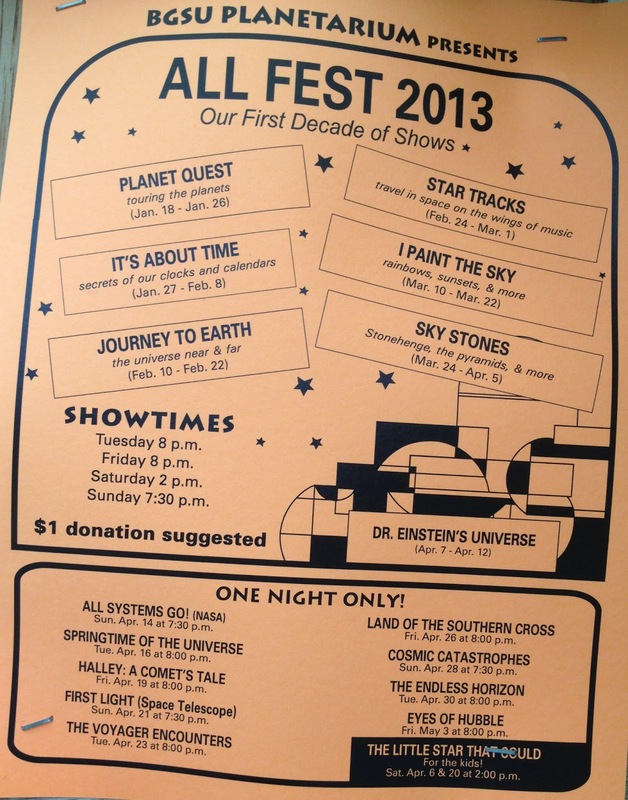 Some of these shows are older than the college students who attend! PLANET QUEST (Grades 5 and up): The appearance of the planets in our sky, how the ancient Greeks thought all planets revolved around the earth, and an imaginary journey to each planet using space art and photography. (public show, 1986) (43 minutes, 358 slides, BG). IT’S ABOUT TIME (Grades 5 and up): The tale of astronomy's greatest effect on our everyday lives: keeping time. Our clocks and calendars record all the cycles of the sk y, such as the rising and setting of the sun and stars, the phases of the moon, the passage of the seasons, and more. The program shows all of these celestial cycles and tells the story of how many early cultures based their calendars on them, thereby cre ating hours, days, weeks, months, years, and all the other ways we keep time today. 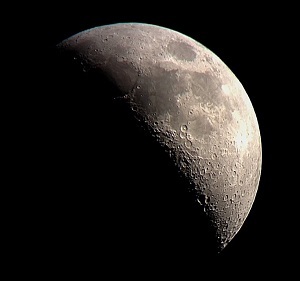 Suitable for use with history or geography as well as astronomy or general science units. (public show, 1987) (47 minutes, 488 slides, BG). JOURNEY TO EARTH (Grades 5 and up): A unique journey from the Milky Way to the universe at large and back to the earth to discover the place of the earth and humans in the universe. The hierarchy of structure (planets, stars, gala xies, clusters of galaxies) and vast distance scales of the universe are built up, and the creation in other stars of the elements comprising humans is revealed. One of our best programs. (public show, 1988) (38 minutes, 345 slides, BG). STAR TRACKS (Grades 3 and up): A guided tour of the winter sky and a just - for - fun "space journey" combining space music and motions of the starfield. (public show, 1985) (48 minutes, 28 slides, BG). I PAINT THE SKY (Grades 3 and up): A guide to the beautiful colors in the sky: blue daytimes, red sunsets, vibrant rainbows, shimmering auroras, icy halos, and more. (public show, 1989) (34 minutes, 476 slides, BG). SKY STONES (Grades 4 and up): An interpretive trip to Stonehenge, the pyramids of Egypt, the temples of the Maya, and several native American sites, all part of the legacy of ancient skywatchers who recorded the movement of the sun, moon, planets, and stars in their great stone monuments. (public show, 1991) (45 minutes, 462 slides, BG). THE UNIVERSE OF DR. EINSTEIN (Grades 5 and up): A biography of Albert Einstein and a conversational approach to explain his revolutionary concepts of the Universe. (public show, 1986) (41 minutes, 258 slides).